Head-Up Display (HUD) is computerized system which projects information onto the screen in range to the viewer on screen or by means of a separate display. Some alternative names of HUD includes VGS (Visual Guidance system), HGS (Head up Guidance system), HFDS (Head up flight display system). The Head-Up Display systems projects data, images and supporting information to the driver in such a way that the driver can view both outside world and the information at the same time. 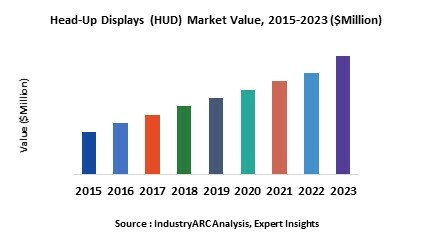 The Head-Up Display (HUD) Market size was $851.6 million in 2017 and is anticipated to grow at a CAGR of nearly 15% during the forecast period 2018-2024. The aviation segment which garnered the major share generated around $307 million in terms of revenue in 2017. Head-Up display (HUDs) are transparent displays that present valuable and critical information into the pilots or users forward field of view. These displays are majorly used in aircrafts and automobiles. Two of the most important parts of driving are being able to see well and knowing where you're going. Head-up display technology works with both of these ideas in mind and it's going to change the way we see the road forever. Heads-up display (HUD) systems can project information on the windshield, tell you where to turn, notify you of lane markings, identify how close the car in front of you is and even give you restaurants information all right in front of your eyes and while you're actually able to see those objects or places. Fighter jets have used a simple HUD system to display altitude, speed and even targeting systems. The technology for HUD varies on the system. Some cars use transparent phosphors on windshield that reacts when a laser shines on it. What are the major applications for Heads-Up Display? The various end users assessed includes Auto motives, Aviation and Wearable’s. HUD in Aviation’s is used to present information to the pilot in the line of their external forward vision which projects key flight instrument data onto a small see-through screen which is positioned in front of the pilot. HUD in auto motives improves driver’s safety, performance, efficiency and comfort through the support of information and communication technology. HUD in nanotechnology is an emerging technology in which the nanoparticles are embedded in the transparent material. These tiny particles can be tuned to scatter only certain wavelengths, colors or light, while letting all the rest pass through, which means the glass remains transparent enough to see colors and shapes clearly through it, while allowing a single color which is clearly visible on the glass. Optical-see through head mounted display (HMD) design is another trend gaining prominence which is achieved by combining the recent advancement of free from optical technology and microscopic integral imaging method which creates a 3D image source from HMD viewing optics, instead of 2D display surface. This optical-see approach will result in compact, Augmented Reality display. Artificial Intelligence is being adopted in the Heads up Display market by employing Cloud terminal. AI acts as a driver’s digital assistant analyzing the driver’s habits at different times of the day and week and on this basis automatically setting the entertainment, navigation and other informations necessary at the required time. With the Holographic HUD the volume of the Augmented Reality Head-Up display will be reduced to minimum. Compared to the currently available systems, the ultrathin Head-Up Display will be three time smaller. It will need less space while at the same time providing a larger image with all the relevant information. Who are the Major Players in Gallium Nitride market? The companies referred in the market research report includes Visteon group, Toshiba corporation, Thales Sa, Robert Bosch, Rockwell Collins Inc., Micro vision Inc., Nippon Seiki Co Ltd, Honeywell Aerospace Inc., Garmin Ltd and more than 10 other companies.